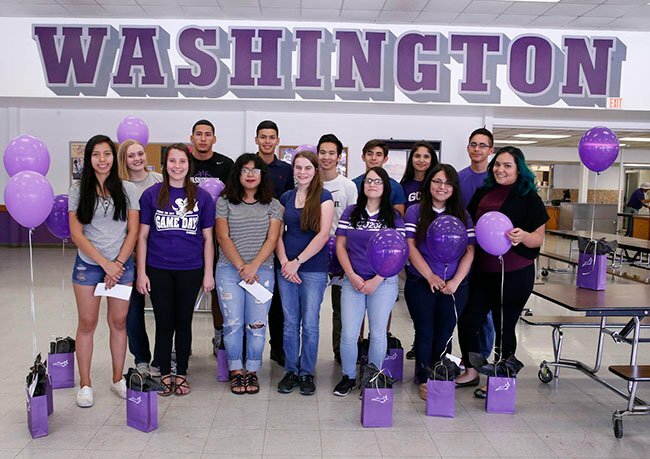 The 14 amazing Washington High School students who received a Students Inspiring Students scholarship have a new home at GCU. When he first heard about the new Students Inspiring Students initiative, Jeff Parsons thought it sounded too good to be true. “Full-tuition scholarships? These kinds of things don’t just happen without a ‘but,’” Washington High School’s assistant principal said. 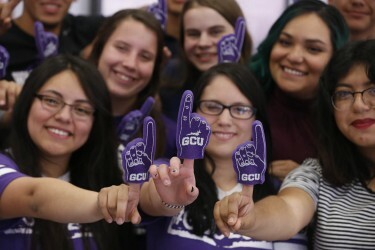 That’s why he still was in disbelief Thursday when he learned that 14 of his students were the recipients of full-tuition scholarships to Grand Canyon University as part of Students Inspiring Students, a collaboration of GCU, the GCU Scholarship Foundation, schools and business and philanthropic leaders. Under the terms of the scholarship, while in high school the students receive academic assistance at GCU’s Learning Lounge, a free after-school tutoring program designed to improve academic skills and confidence. They then pay it forward by providing 100 hours per year of mentoring and academic support at a Learning Lounge site while at the University. Quyen Phan could finally say his hard work paid off. Quyen Phan, who was born in Vietnam and arrived in the United States when he was 6, said holding the scholarship award letter in his hands was a testimony that “hard work eventually pays off” — the motto that kept him going for as long as he could remember. And yet, despite his fears, Phan took on college English courses during his time at Washington while handling household responsibilities his non-English-speaking parents could not do on their own. But, most important, Phan said he wants to return to Vietnam. Lope Country, welcome 14 new Lopes. Sergio Bahena and Pahoran Fornes quietly celebrated their accomplishment by whispering to each other. But when asked what the letter they were holding was, both immediately gleamed. Bahena said he can’t wait to jump into the criminal justice program at GCU, fulfilling a dream he has had since middle school, and serve as a role model in his community. Fornes said it meant there was hope for his family. Fornes has been in the U.S. since he was a week old, living with an aunt and uncle while his mother and stepfather reside in Mexico. Without a work permit, Fornes has been unable to obtain a job, but with a full-tuition scholarship to GCU he plans on becoming an engineer to eventually help his mother. “Of course I miss them every day, but I’ve learned to deal with it so that someday I can provide for my mom just like she has for me,” he said. For many of these inner-city students, these life-changing opportunities are not only for them, but for their families. Washington High School, near Glendale and 23rd avenues, has had to find different ways of making sure that all of its students receive a quality education, Parsons said.